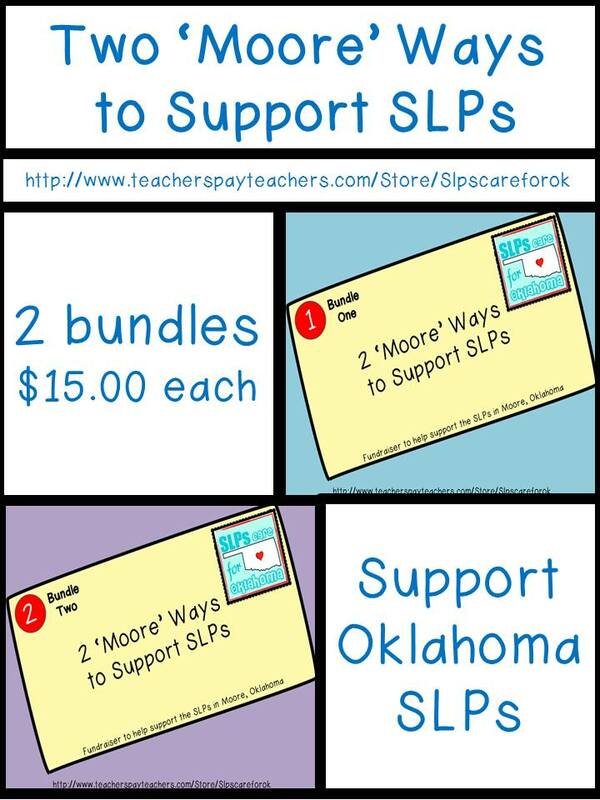 "Moore" Help for the SLPs in Oklahoma! What is it? Two HUGE bundles each worth over $140+!! Each bundle of SLP materials is available to you for only $15 each! ($280+ worth of product for only $30). What is even better? ALL proceeds go directly to Moore's paypal account and no where else. Cool right? The 2 bundles should be available until June 30th! You have plenty of time to save $30 for this great cause and you get TONS of materials out of it (I totally have to go make my purchase! Excited!). We also have some great companies that have donated to the 4 SLPs who lost everything in the tornado. Click Here for Amy's Blog! Don't want the bundles (seriously you don't? ), or if you want to donate MOORE, Amy has posted a direct link to donate to paypal on her blog. If you would like to donate other materials contact Amy using her blog, to get her address to send materials (or just love in cards or pictures).